Brushing your dog’s teeth doesn’t sound like a hard job. However if your dog has never been exposed to brushing we suggest you start slowly. Pick a time when your dog is calm and quiet. It will be very helpful. After a play session or a long walk maybe. When your dog is relaxed you can begin to get your dog used to the brushing process. First of all begin the few times by not use a toothbrush. With your finger gently stroke the outside of your dog’s cheeks with your finger. After your dog becomes comfortable with your touch, place a small amount of doggie toothpaste on your finger. Let your dog get used to the taste of it. Dogs love the taste of dog toothpaste products. Never use human toothpaste. It foams too much and dogs dislike this sensation. They don’t really care for the flavor either. There are several types of brushes on the market that work great for most dogs. They range from a traditional style brush to a small over the fingertip brush. The fingertip brush is the easiest to introduce so it is the most commonly used. Gradually increase the number of teeth you brush after your dog is used to the toothpaste and brush. It is important to eventually brush all of your dog’s teeth. Plaque and tartar have a tendency to build up on the back molars. They are often overlooked because the tartar cannot be seen unless the dog’s gums are pulled back. Go slowly and gently. Stop brushing before your dog begins to fuss. It’s not important to brush all of the teeth at one time. Stop each session while it is still fun for your dog. Give your dog lavish praise during and after brushing. Tarter doesn’t accumulate much on the inside surfaces of the teeth. Concentrate your time brushing the outer surfaces of the teeth and gums instead. Follow these simple steps and your dog will actually look forward to brushing. 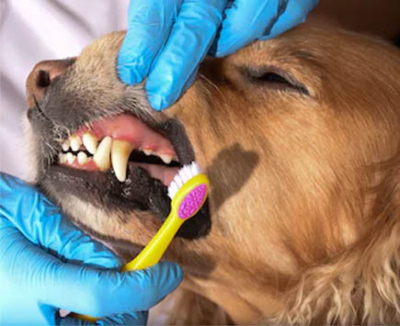 Brushing your dog’s teeth at least 3 times per month will prevent tartar buildup. Proper brushing can improve your dog’s overall health and reduce costly veterinarian visits.